Welcome to Issue 20 of SHAPE Journal. 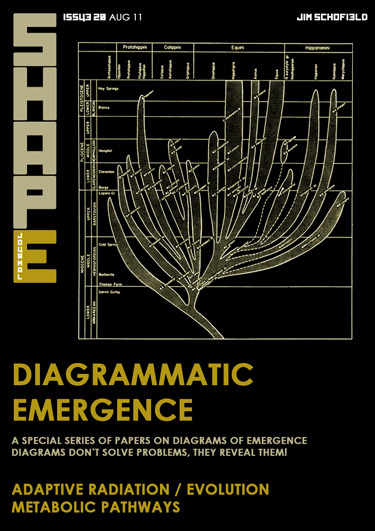 This issue of SHAPE Journal contains a closely related series of papers, in which the trajectory of significant qualitative change in an Emergence is tackled, diagrammatically. Of course, the elements of such considerations are still concepts, processes and transformations, but the spatial idioms of diagrams delivers that extra “dimension” of simultaneous portrayal, which does, indeed, allow quite involved transitions to be laid out, considered and significantly improved. A words-only argument can be as much about winning as revealing, and it is clear to this author that without these kinds of diagrams, we would not only find solving such problems considerably more difficult, but we would also be bereft of the best initial means of communicating the ideas involved too. The trajectory of Creative Change in an Emergence, such as that of the Origin of Life on Earth, involves contradictions, phase changes, and major transformations – even of the probabilities of events, and it is these features that must be understood. These papers do not complete the job, but they were fundamental in the creation and publication of this author’s Theory of Emergences in 2010. In the following issue of SHAPE there will be something of a return to the usual format, in that it will contain three instalments of papers including the long running Demise of Formalism series. In addition there is a short essay entitled The River, which is about the importance of analogies is coping with a complex world. As always, there is a regular stream of related and sometimes very different items on the Blog, and occasionally possible links to friendly sites the most recent one being the Red Eye Portal. Our new policy of regularly producing Reviews on our Blog is continuing with the pieces mentioned above. So this will indeed continue to happen at regular intervals from now on. Read and enjoy, and if moved to do so, react! Send us your views for publication in the Journal. We look forward to such reactions as they inform us of what our readers require. Left to ourselves we will not necessarily produce from our prodigious store of work in the best possible order.